JD Beltran, whose installation, Downtown Mirror, was featured in the 2008 01SJ Biennial as a public art project commissioned by the City of San Jose, was recently awarded a writing fellowship for her sfgate.com "City Brights" blog where she writes about arts and culture. The fellowship was awarded by the Creative Capital/Warhol Foundation Arts Writers Grant Program in partnership with the International Art Critics Association/USA Section (AICA/USA). JD Beltran also participated in Montalvo's 2009 Starry, Starry Night: Art & Astronomy Slumber Party in presenting AstroTable with Onomy Labs. J.D. Beltran is a conceptual artist, filmmaker, and writer exploring the contexts, language, and scope of how one can portray and mirror back a subject -- whether that subject be a person, a city, an atmosphere, an episode, a time. She received her M.F.A. degree from the San Francisco Art Institute, as well as a J.D. from the University of California, Berkeley Boalt Hall School of Law. 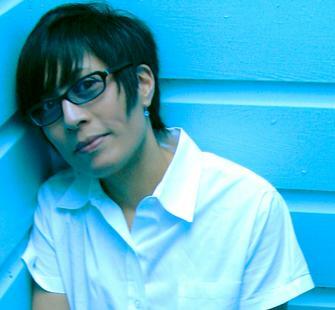 Her work, executed in a multiplicity of mediums, has been screened and exhibited internationally including at the Walker Art Center, the San Francisco Museum of Modern Art, The Kitchen Gallery, New York, The Singapore Digital Mediafest, the Biennale for Electronic Arts in Perth, Australia, the Yerba Buena Center for the Arts, and both the 2006 and 2008 ZeroOne San Jose New Media Biennials. She also is a member of the San Francisco Writers Grotto. She has been commissioned for public art projects in a variety of cities, including San Francisco, San Jose, and Cleveland, Ohio, and her work has been reviewed in the New York Times, the Wall Street Journal, and the Boston Globe, as well as in Art In America, ArtNews, the New Art Examiner, and Art Papers. She has served on the boards of the San Francisco Arts Commission Gallery and SFCamerawork, and currently is on the board of the Yerba Buena Center for the Arts. She is faculty in the New Genres, Interdisciplinary Studies, Critical Studies, and Urban Studies Programs at the San Francisco Art Institute, where she is also Chair of the Post-Baccalaureate Program. She lives and works in San Francisco.